Researchers: Shfaqat A. Khan and Per Knudsen, Technical University of Denmark; Ingo Sasgen and Veit Helm, Helmholtz Centre for Polar and Marine Research; Michael Bevis, Ohio State University; Tonie van Dam, University of Luxembourg; Jonathan L. Bamber, University of Bristol; John Wahr, University of Colorado (Deceased); Michael Willis, Cornell University; Kurt H. Kjær and Anders A. Bjørk, University of Copenhagen; Bert Wouters and Peter Kuipers Munneke, Utrecht University; Beata Csatho, University of Buffalo; Kevin Fleming, GFZ German Research Centre for Geosciences; and Andy Aschwanden, University of Alaska. 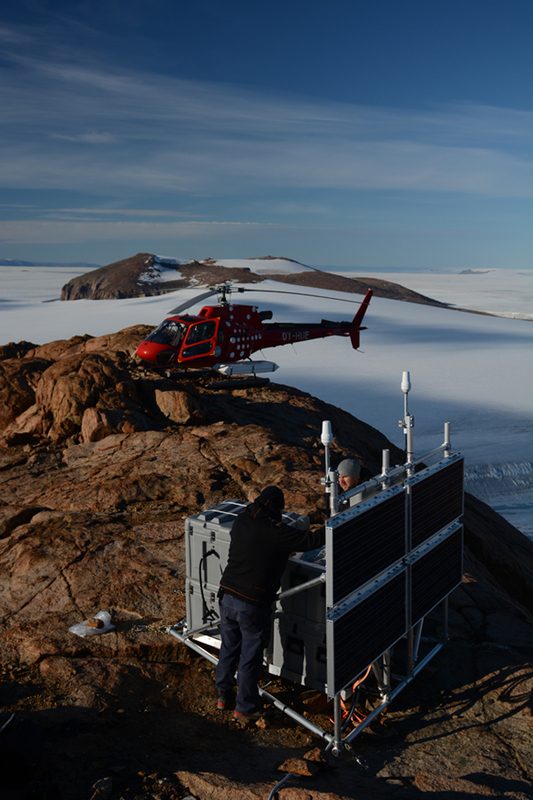 Global Positioning System (GPS) measurements of the uplift of the ground surface beneath the Greenland ice sheet is critical to determining the amount of ice mass that has been lost since the Last Glacial Maximum (LGM). The lost ice mass contributes to sea level rise and explains the contribution of the Greenland ice sheet to present-day sea level rise. 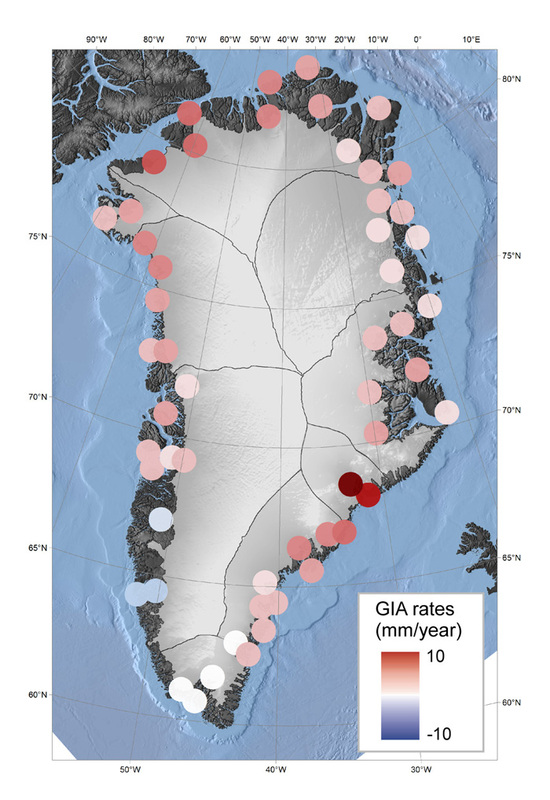 The GPS data show larger uplift rates than previously recognized and suggest that satellite studies have underestimated the ice mass loss by about 20 gigatons per year or about 1.5 meters of sea level rise since the LGM. 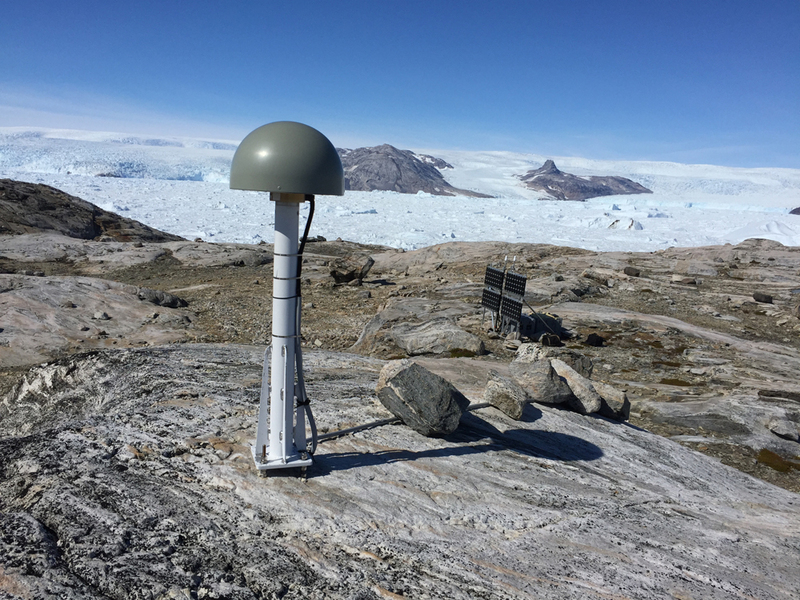 The Greenland GPS network (GNET) consists of 54 stations stably mounted in bedrock and able to measure any horizontal or vertical changes in the surface of the bedrock over many years. These stations are near the coast where bedrock is exposed because most of Greenland is covered by large ice sheets and associated glaciers. Since the LGM (about 21,000 years ago), the ice has been melting away and the continent has been rising as the ice mass is lost. The rate of ice loss has been accelerating as global temperatures rise due to climate change. The most significant changes in Greenland are observed where glacial systems reach the coast and can flow into the ocean. Of the seven major drainage basins, six show uplift while one basin in the southwest shows subsidence in the GPS data. Basins in the central, southeast and northwest show the greatest uplift and account for about 40 percent of the ice loss since the LGM. Besides a warming planet, another factor that may account for the uplift rates, particularly in southeast Greenland may be the hot spot plume that now underlies Iceland. 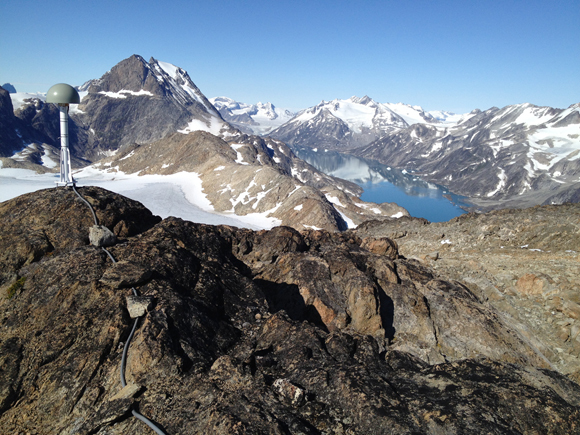 The plume sat beneath Greenland leaving a warmer and softer mantle beneath southeast Greenland. The structure of the mantle then contributes to a larger uplift at the surface as more ice is lost. The GPS uplift rates can be used to refine models of glacial isostatic adjustment (GIA) since the LGM by adjusting the viscosity of the mantle and the history of glaciation. The GPS observations in southeast Greenland are particularly critical for refining these models because that is where the hot spot plume was beneath the continent and there are no relative sea level measurements along this part of the coast. The refined models indicate that the past ice mass loss has been underestimated by more than 100 percent. About 1.4 meters more in sea-level equivalent has been lost from Greenland since the LGM and more of the ice loss is from southeast and northwest Greenland. The GPS uplift rates and refined glaciation history can be compared with the Gravity Recovery and Climate Experiment (GRACE) satellite observations. The GRACE observations using an older model underestimate the amount of ice loss by 19 gigatons per year. S. A. Khan, I. Sasgen, M. Bevis, T. van Dam, J. L. Bamber, J. Wahr, M. Willis, K. H. Kjær, B. Wouters, V. Helm, B. Csatho, K. Fleming, A. 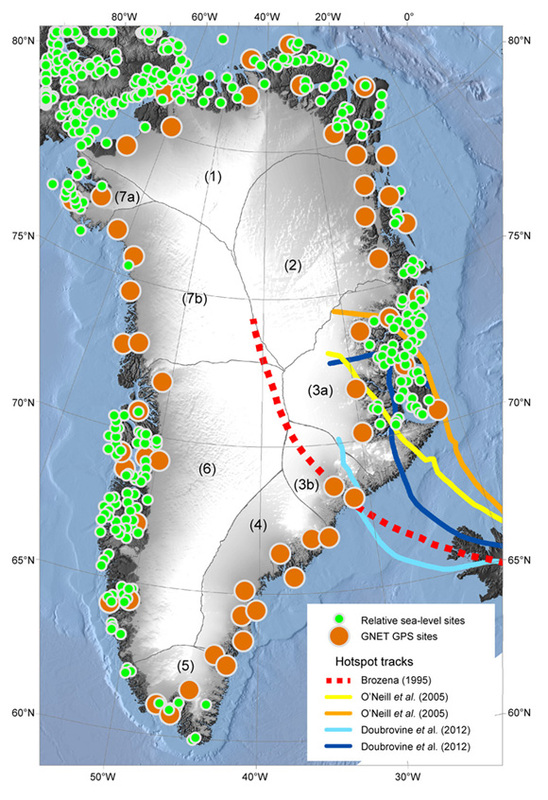 A. Bjørk, A. Aschwanden, P. Knudsen, P. K. Munneke, Geodetic measurements reveal similarities between post–Last Glacial Maximum and present-day mass loss from the Greenland ice sheet. Sci. Adv. 2, e1600931 (2016). 10.1126/sciadv.1600931.